Although the benefits from technologies under dryland conditions have been relatively small, average crop yields would almost certainly be lower without them. This is because the capture, storage, and use of water in low and erratic precipitation regions have decreased because of the loss of soil organic matter (SOM). It is well documented that SOM levels decline when land is converted from grassland or forest ecosystems to cropland. The decline is most rapid in the first few years following conversion, and then continues at slower rates until a new steady state is reached. After 50 to 100 years, SOM levels are often 50% to 60% lower than the initial levels (Cole et al., 1993). These large losses of SOM have significant negative impacts on the soil structure and water-holding capacity of the soil, which makes limited precipitation even more limiting. Soil management practices have significant effects on both the rate and extent of SOM decline and restoration. Stewart et al. (1991) pointed out that the maintenance of SOM becomes more difficult as temperatures increase and the amounts of precipitation decrease. The reasons are many, but are dominated by the fact that SOM decomposition is accelerated with rising temperatures, and the production of biomass to replenish SOM reserves declines as water becomes more limiting. Notes: PAW = plant available soil water content at seeding; SOM = soil organic matter. a Nitrate-N in 180-cm soil profile at end of experiment. b Average plant-available water in 180-cm soil profile at seeding time. c Winter wheat seeded annually at approximately October 1 and harvested at approximately July 1 the following year. d Winter wheat seeded at approximately October 1 every second year; approximately 15 months fallow between crops and yields shown must be divided by 2 to indicate annual land production. e Tillage was delayed for approximately 10 months following wheat harvest; weeds and volunteer wheat were allowed to grow during the 10-month period. Source: Adapted from Johnson, W.C., C.E. Van Doren, and E. Burnett. 1974. Summer fallow in the southern Great Plains. In Summer Fallow in the Western United States. Conservation Research Report 17. U.S. Department of Agriculture, Agricultural Research Service, Washington, DC, pp. 86-109.
when stubble-mulch tillage was used in comparison to oneway disk tillage, and this increased soil water storage resulted in higher yields. The experiment also included a treatment that did not have any tillage until about 10 months following the wheat harvest. Weeds and volunteer wheat plants were allowed to grow during the summer and fall, and then stubble-mulch tillage was used in the spring. This treatment was by far the most effective in maintaining SOM, because there was a lot of biomass produced that was later incorporated into the soil surface. The average yield was also comparable to the other treatments because there were still about 5 months during the wettest part of the year to capture and store precipitation in the soil profile before seeding wheat. This system is not aesthetically acceptable, however, because enormous amounts of weed seed are produced that spread to other fields by wind, birds, insects, and other forms of transport. 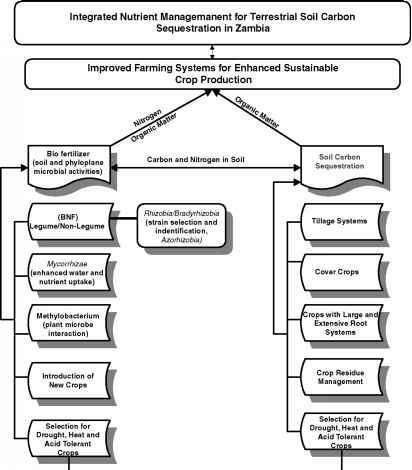 It is useful, however, to show the importance of returning crop residues to the soil and reducing the number and intensity of tillage operations for maintaining SOM in the soil. The study also demonstrated the relationship between SOM loss and mineralization of soil nitrogen (N). It is well established that SOM contains about one part of N for every ten parts of carbon (w/w). As the SOM decomposes, N is mineralized and made readily available for use by growing plants. When SOM decomposition is rapid as is often the case in semi-arid regions, N can be released in excess of plant needs because the first limiting factor for crop production in these regions is water. Therefore, N can accumulate in the soil profile in large amounts as shown in Table 14.2. This excess nitrogen is subject to losses by leaching and denitrification. In time, N becomes limiting in these regions because SOM decomposition slows to the point that insufficient N is released to meet the needs of crop production, particularly during years of above-average precipitation. Phosphorus (P), sulfur (S), and other nutrients are also contained in SOM and are released during its decomposition. In the short term, the decomposition of SOM is very positive for crop production, but the long-term effects are devastating because of reduced soil structure, plant-available soil water storage, and fertility. Perhaps even more important, these losses make it extremely difficult to restore SOM because C can only be sequestered as SOM when there is sufficient N, P, and other essential elements available.